Now, how good is that! 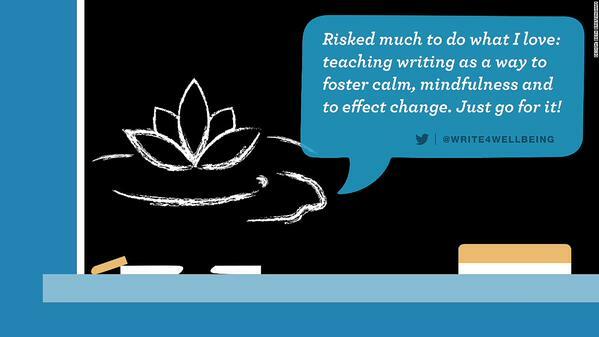 So here is confirmation of what I already knew – teaching Writing for Wellbeing is one of the best jobs in the world! And even though I earn my living doing it, it is difficult to think of it as a ‘job’. I think of it more as a vocation – something I am called to do because my teaching spreads positivity and helps people find their own inner wisdom. And I love doing it, I really do. I am expanding the workshops I am leading, both in number and in geographical spread. I am working to organize workshops in libraries and other venues, and hope to find new wonderful places in the North West, West Yorkshire, and Scotland very soon. Maybe even beyond! If you would like a workshop in your area, or can recommend a venue, please do get in touch. Me, I just want to do more of what I love, and see the smiles of people opening up in self-awareness and joy!